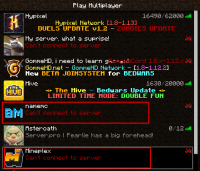 A few Minecraft servers display "Pinging..." followed by "Can't connect to server", occasionally. This appears to happen when opening the multiplayer/server list for the first time or after the minecraft client startup or when refreshed the multiplayer server lists. It appears that most parts of the code analysis of MC-73207 apply again. There has been some refactoring (LazyLoadBase uses a Supplier now) which likely replaced the fix by accident. The following class might be a better replacement for or addition to the LazyLoadBase class. The only restriction is that the factory should be thread-safe.